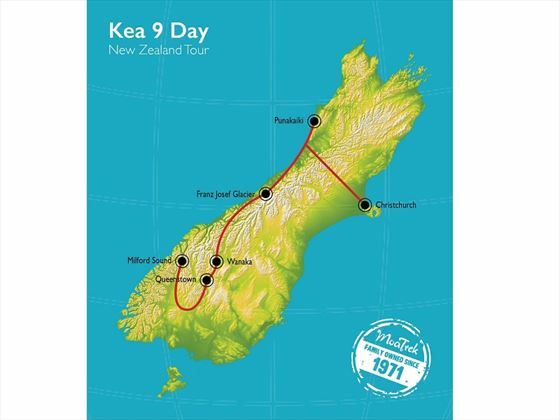 Today you will travel alongside Lake Wakatipu to Te Anau and Milford Sound, located in Fiordland National Park. 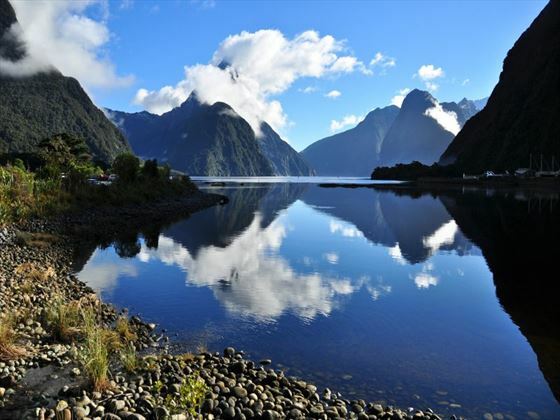 Take the Milford Road which is studded with waterfalls, mirrored lakes and glaciers. Once you’ve arrived at Milford you’ll take a boat tour to explore this area properly with a nature guide. 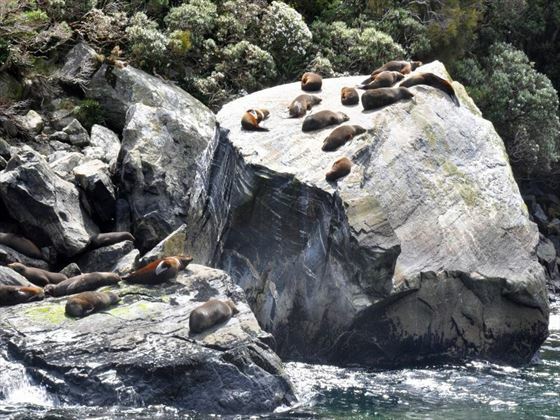 At the point where the sound reaches the Tasman Sea, you’ll be treated to sightings of a playful seal colony as they lounge on the rocks. 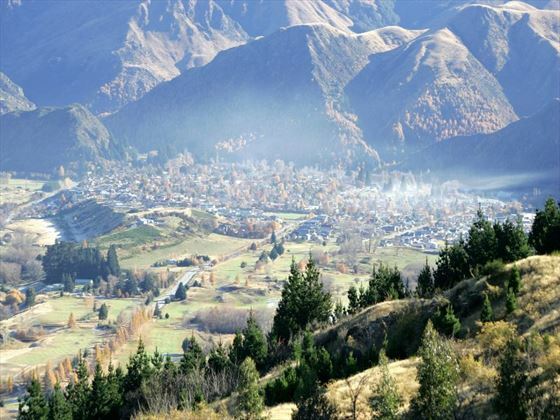 Return to Queenstown by way of a scenic flight over the Southern Alps and Lake Wakatipu. 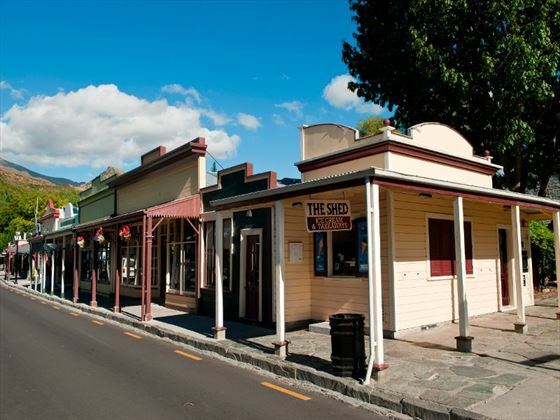 Your first destination today is the leafy village of Arrowtown which has a lively gold mining history. 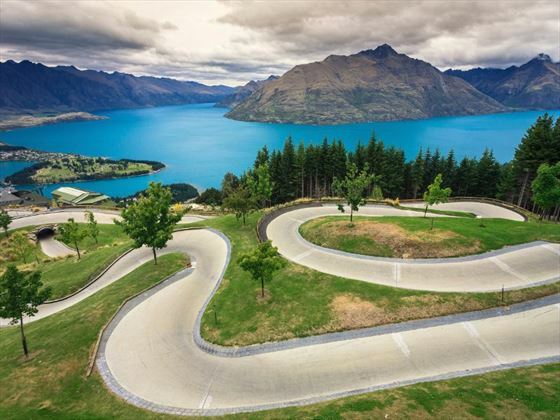 The road then climbs over the Crown Range, offering amazing views of the Gibbston Valley. 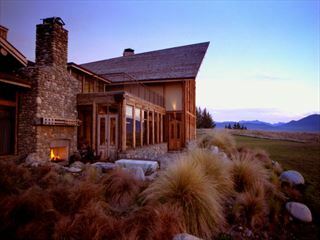 There will be time to stop off at the Cardrona Hotel which also has a gold mining history, before continuing to a Wanaka homestead for your private lunch. 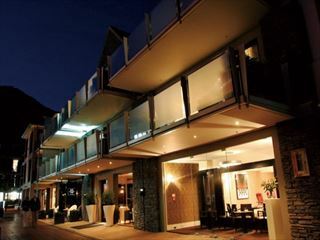 There will be free time after lunch to explore the town before returning to your hotel for the night. 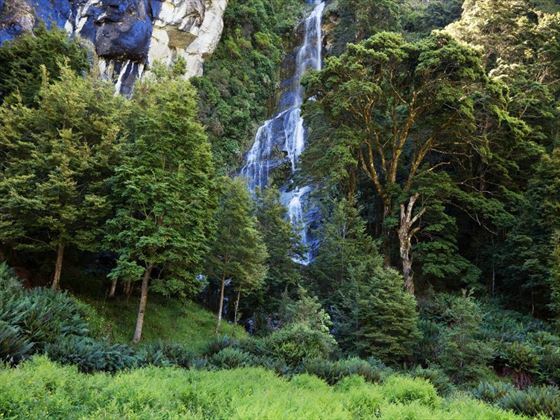 Driving along Lakes Hawea and Wanaka and into the pristine mountain scenery, you’ll begin today’s journey venturing along the Haast Pass in Mt Aspiring National Park. You can follow the tracks through the native beech forests to crystal-clear pools where trout thrive and magical cascading waterfalls. Continue north through the Westland World Heritage Park before reaching Fox Glacier and Lake Matheson, which is famous for its clear reflections of the Southern Alps. Drive to the settlement of Okarito today, which is situated between the Tasman Sea and Okarito Lagoon. Depending on which you’d prefer, you can either take a gentle kayaking excursion or take a cruise onto the shallow waters of the lagoon. 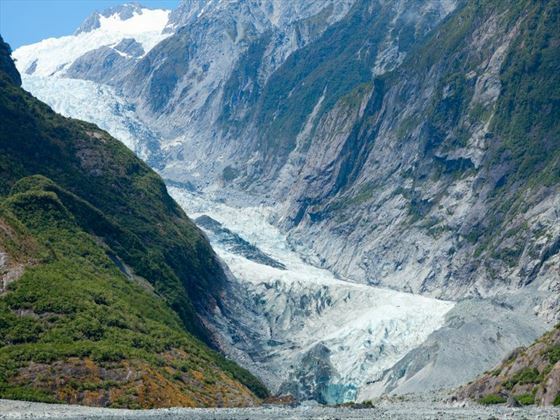 Revel in the tranquillity of this remote World Heritage Park and perhaps take an optional flight over Mt Cook with a glacier landing; alternatively, end the day with a dip in the hot pools which are fed by pure glacier water. 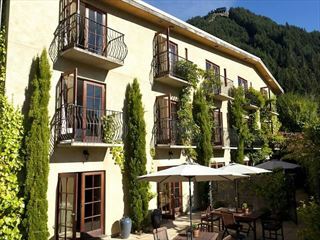 Travel north and pass the mirror lakes, winding rivers and the Southern Alps along the way. At Hokitika, you’ll have the opportunity to visit some artisan craft galleries, such as glass blowing and pounamu (greenstone) carving. 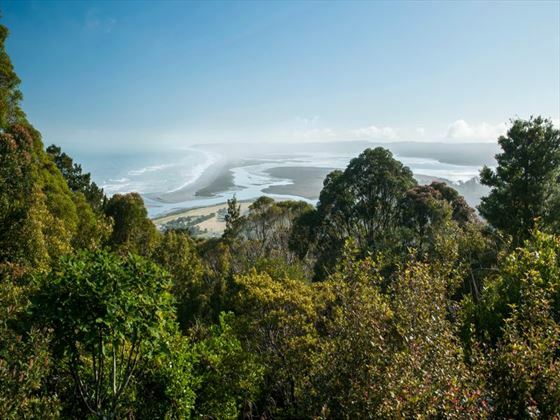 The coastal road follows part of the ancient trails used by Maori and leads you to the hotel in Punakaiki. 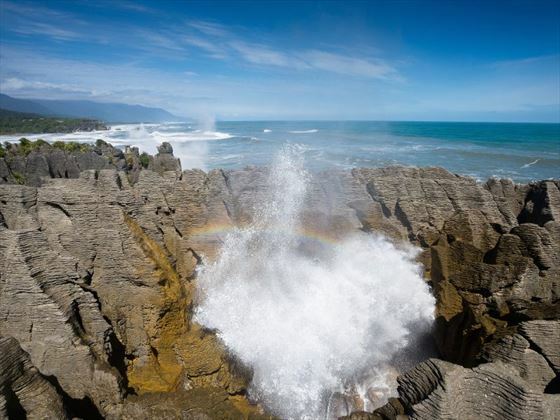 Just a short distance from here are the famous Pancake Rocks, surrounded by towering cliffs and blowholes.